County were yesterday drawn to face League 1 side Montrose in the third round, which will take place on the weekend of October 13/14. County comfortably put their name in the hat for the last-16 draw thanks to Saturday’s 5-0 victory over Raith Rovers at Victoria Park, which followed a 2-1 triumph over Hearts colts in the opening round. Kettlewell previously won the competition as a player when he helped the Staggies win 2-0 against Queen of the South in 2011, however the tournament has since seen the introduction of colts teams, along with clubs from Wales, Northern Ireland, Republic of Ireland and England. 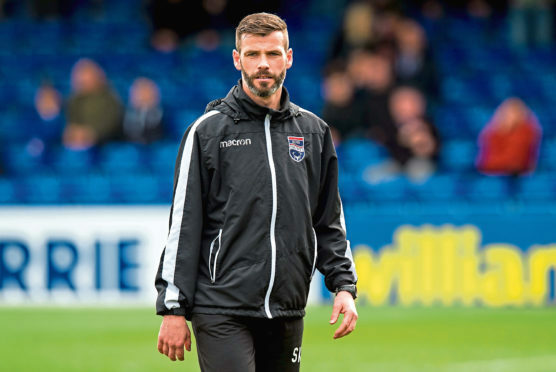 Although County have not been handed a cross-border draw, Kettlewell says the novelty factor makes it an appealing prospect should the Dingwall side progress past their Angus opponents next month. Kettlewell said: “I will probably get lambasted for saying so but I like the idea of other clubs, from England, Ireland and Wales, being in there. “Not everybody is going to say the same thing, but for me it’s nice to prepare for something slightly different, in terms of the players and style of football. “I have played in the competition and won it as a player with Ross County. It was good, but it’s nice we are throwing something a bit different in there. “I get that a lot of clubs will say they are not 100% behind it and don’t particularly like it. Promotion back to the top-flight is County’s main priority this season, with the Staggies top of the Championship after four games. Kettlewell reckons success in the IRN-BRU Cup can keep the winning feeling going, with a quarter-final place at stake against Stewart Petrie’s men who sit seventh in the third-tier at present. He added: “Every game we play, we want to win. Just because we make four changes, or 10 changes, we only do that in such a way that we still believe that group of players can still win that game.